The Magpies finally bade farewell to Barton last night, when the 28-year-old signed a four-year contract at Loftus Road. Though he used his controversial Twitter account to thank United fans for their support over the last four years, he could not resist a parting shot at United owner Mike Ashley and managing director Derek Llambias. 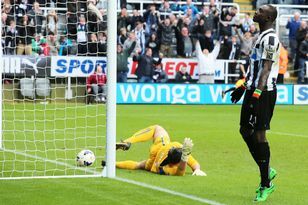 Barton wrote: “I will always have a special relationship with the Geordie nation but sadly they are not the decision makers at St James’ Park. I wish to thank each and everyone of them sincerely for their support. So Barton has finally departed, but Newcastle remain positive regarding Pieters. Reports in Holland had claimed the PSV Eindhoven defender was already on Tyneside after the two clubs had agreed a fee for the player. United boss Alan Pardew is hopeful a deal could be in place in time for tomorrow’s Premier League home game against Fulham. Failing that, however, the 23-year-old seems certain to be a United player before the transfer window closes on Wednesday, after admitting that a move to England could prove impossible to turn down. “If a club from the Premier League says they want you, and that is the case, then you know the financial means they have,” Pieters said. By Wednesday, Pardew also intends to add a striker to his squad – with Sochaux’s Mali international Modibo Maïga still on the radar. The United manager said: “I am hoping so, but the finance side of it is out of my hands. Whether that includes a like-for-like replacement for Barton remains to be seen. The midfielder had been on the transfer list, available for free, after infuriating the St James’ Park top brass with a succession of Tweets critical of their approach to the running of the club. On joining QPR yesterday, his comments could be interpreted to have included a thinly-veiled swipe at Newcastle’s ambition. Barton added: “It has been quite a whirlwind, so to get things finally sorted and draw a line under it all is a great relief. “The ambition of the club impressed me. There is a great set of lads here already and that is why they had such a great season in the Championship. While Llambias maintained a dignified stance in bidding Barton goodbye, QPR boss Neil Warnock clearly believes he has landed a bargain. Warnock added: “We have a very, very good player on our hands. “He is coming here to show people what he can do. He wants to get back into the England team. “He is very enthusiastic. People will say one or two things about him, but they have said stuff about me too, so I will not worry about that. Barton could make his QPR debut against Newcastle. If the former Manchester City midfielder does not play for his new club at Wigan today, their next game is against United at Loftus Road on September 12.